Andy Bishop is unhappy with the bureaucratic delay that has disrupted his loan spell at Wrexham. 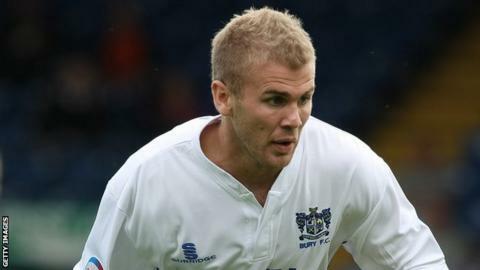 The Bury striker made his Wrexham debut in Saturday's 0-0 draw at Luton Town, a week later than expected after a delay processing his international clearance. Bishop revealed the delay has forced him to join as an emergency loan signing, which has shortened his stay. "It runs out now in December [rather than January] and I think there is a call-back in it as well," said Bishop. "That's a bit disappointing for me and the club, so I'm just here until December and I'll have to see how many goals I can score and see how much I can help the club. "It's been a bit frustrating but in a way it's helped me get to know the lads better, get to know how the team plays... I'm just glad to be playing now." Wrexham boss Andy Morrell had blasted Bishop's loan clearance as a 'joke' when the striker had to sit out Wrexham's 4-1 Blue Square Bet Premier win at Cambridge United. Wrexham and fellow Welsh clubs Swansea City, Cardiff City, Newport County, Merthyr Tydfil and Colwyn Bay play in the English league pyramid. That means that any player movement between these six clubs and their English counterparts must be agreed by the Football Association and the Football Association of Wales, then ratified by world football's governing body Fifa. After their point at Luton, Wrexham are in action next Saturday at home against another potential promotion rival in the shape of Dartford.